NEIVA (2010 South American Championship for Men) - Colombia defeated Chile 78-71 to play against Paraguay for fifth place in the South American Championship. The fifth place game is at 17:00 and at 15:00 Chile faces Ecuador for seventh place. The Colombians maintained the lead from the start with a balanced offensive attack and the Chileans stayed close, but could not take the lead since they didn't have an efficient long distance performance. Colombia won the first quarter 20-14 and at halftime their lead was 41-33 as Stalin Ortiz had 13 points and Enielsen Guevara 9. In the second half Chile tied the game at 41 and at 45, but the offense by Ortiz and Edgar Moreno gave Colombia the lead and finished up 58-52. In the final quarter Colombia never lost the lead and secured from the free throw line. 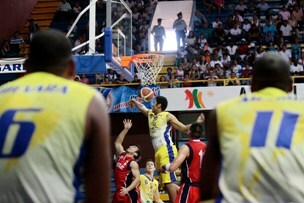 Stalin Ortiz had 22 points, Enielsen Guevara 17 and Edgar Moreno 12 for Colombia. Chile had Patricio Briones 17, Jose Campos 12 and Evandro Arteaga 11.